and hence we have the following result. between P1 and P2 is denoted by d(P1, P2) or d(P2, P1). Example 1 Find the distance between the points (−2, 3) and (1, 7). 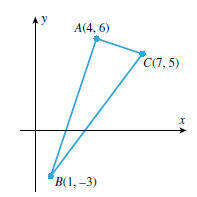 it follows that ABC is a right triangle with hypotenuse BC. 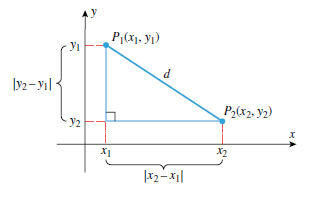 Example 3 Find the midpoint of the line segment joining (3,−4) and (7, 2). This is called the standard form of the equation of a circle. 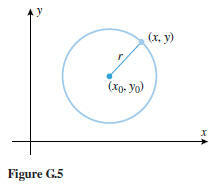 Example 4 Find an equation for the circle of radius 4 centered at (−5, 3). 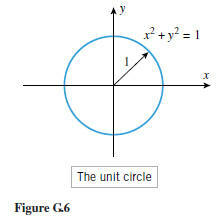 importance; it is called the unit circle (Figure G.6). Analternative version of Equation (3) can be obtained by squaring the terms and simplifying. where A, D, E, and F are constants and A ≠ 0. Thus from (3), the circle has center (4,−1) and radius 3. • (k < 0) The equation has no real solutions and consequently no graph. are x = 1, y = −4. 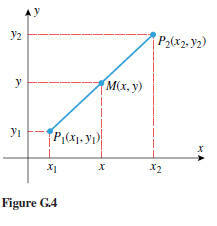 Thus, the graph of the equation is the single point (1,−4). The following theorem summarizes our observations. general equation of a circle. where A ≠ 0, represents a circle, or a point, or else has no graph.